I provide a personalised, friendly service to help you create your own bespoke wedding dress. 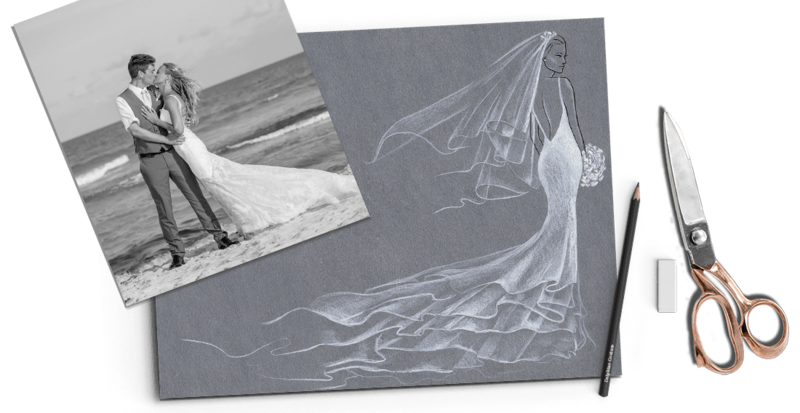 You can be involved in each step of the dress making process, from choosing your own materials and style to creating the dress to match the theme of your wedding. As well as creating your own bespoke bridal gown, I can also create made to measure garments for the whole wedding party including Bridesmaid's Dresses and Mother of the Bride Dresses. My services also include general evening wear for special occasions. If you already have a bridal or special occasion dress but need it altered, I provide a dress alteration service. Anything from minor to major dress alterations can be addressed, for example reducing a dress many sizes too big to fit you perfectly. This includes evening gowns, bridesmaid dresses or prom dresses. Simply get in touch for a free consultation. Designers I work with on a regular basis include: Jenny Packham, Ian Stuart, Claire Pettibone, Essense of Australia, Grace loves Lace, Eliza Jane Howell, Charlie Brear, Rembo Styling, Anna Sul Y to mention a few. Quotations are provided individually, to find out how much please contact me below for a personalised quote. I can create any accessories you require to add to your special day - from veils to bolero's, jackets and capes. These are all made to measure using the highest quality materials. Each accessory will be hand crafted to fit you beautifully and compliment your gorgeous dress. I can also make accessories for the bridal party to match your colour scheme from waistcoats to cravats and handkerchiefs. Please see the pricing below as a guide and request an appointment to discuss your requirements further.